It’s around noon on a Tuesday and I’m parked on a quiet, secluded suburban street, crouched down in the driver’s seat praying that no one drives by and sees what I’m doing. Oh, the shame. But I had to try it. Just once, I promised myself. Just once because I knew how bad it was for me, but it was only the ONE time. One time wouldn’t hurt, right? It was so good, my mouth hurt. Tears came to my eyes. It was as wonderful, but oh-so-bad, as I thought it would be. 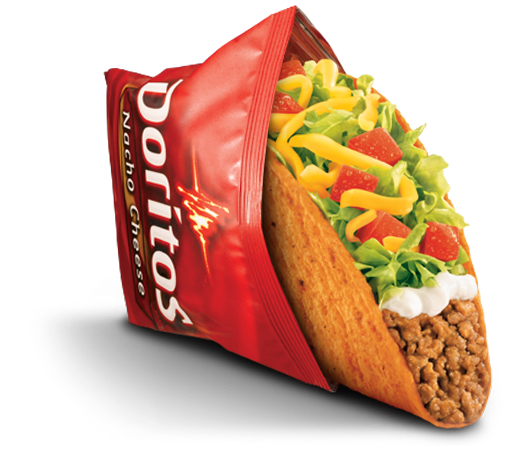 I had just eaten a Locos Taco – the Dorito-wrapped taco from Taco Bell. And I loved it. When I was kid, I loved iceberg lettuce with Miracle Whip on Wonder Bread. I miss that sandwich. Given the opportunity today, I would eat an entire box of Kraft Macaroni & Cheese. In the privacy of my own home, I pour so much Frank’s Red Hot Sauce on my pizza, it drips down my hands. 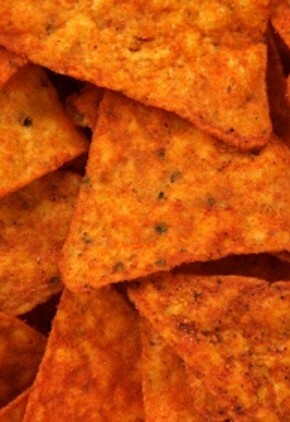 And I truly love Nacho Cheese Doritos. But you probably will never see me eat any of these things. Some things just need to be kept in the closet, or the front seat of my car on a quiet street, as it were. “Oh, I’d NEVER eat that!” A woman I met was telling me about a dish her husband (who is a chef at a popular restaurant here in Denver) has on his menu - A deep-fried, bacon-wrapped hotdog stuffed with cheese & jalapeños. This man is a cheffy GENIUS. Bacon? Cheese? Jalapeños? Fried? Hotdog? In polite circles, this quintet of culinary words should not be uttered in the same recipe. The next week, I asked AJASCIT (Assistant Junior Apprentice Chef In Training, AKA my husband) to take me out to lunch. I told him about this new restaurant I wanted to check out (ahem). “Let’s have an early lunch. I want to get there right when it opens because it might get busy.” I was thinking that the less witnesses to my degradation the better. We were the only people in the restaurant. Good. I opened up the menu and casually said to my husband, “Oh, look. This sounds interesting. A deep-fried, bacon-wrapped hotdog stuffed with cheese & jalapeno. That’s what YOU should order.” He looked at me like I was insane and said, “I’d NEVER eat that!” Shoot. He was supposed to be my cover and all of a sudden Mr. Chef Boyardee was too embarrassed to order a simple hotdog. Well, we WERE the only people in the restaurant, so I figured, what the heck. I’m going to order it. No one will know other than the server and my husband and he loves me no matter what. “I’ll have the hotdog,” I said to the server when she came to take our order. “I’m sorry?” she replied, as if she hadn’t heard me. “I’ll take the HOTDOG,” I said a tad too forcefully. Just saying “hotdog” didn’t sound quite as bad as “I’ll take the deep-fried, bacon-wrapped hotdog. With fries, please.” Again she looked at me, not a little confused. Maybe this was her first day and she didn’t know the menu. People were starting to arrive for lunch and I couldn’t bear the idea that anyone would hear what I was ordering. I didn’t want to fully speak it aloud, so I just pointed to the item on the menu. “Really?” She said incredulously. She wasn’t being sarcastic or mean. I could see that she was truly shocked. AJASCIT gave me a look that said how proud he was of me for not caving into society’s mores. Then he ordered a grilled chicken sandwich, no cheese and a side salad. A short time later, the restaurant was totally full. Damn, there would be witnesses. I was just about to ask AJASCIT to switch seats with me so my back could be to the dining room (better to shield the view of my shameful lunch) when our dishes arrived. There it was, in all of its glory. 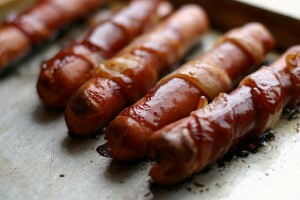 Crispy, glistening bacon was spiraled perfectly, so beautifully around the hotdog like an edible, luscious barber pole. The cheese was oozing slightly from beneath the bacon. I could see little flecks of bright green jalapeños mixed in with the cheesiness goodness. All of a sudden, the restaurant patrons weren’t there. The shocked server didn’t exist. I couldn’t hear what was AJASCIT was saying because the angels in my head were singing so loudly. I took a bite and almost passed out. So yeah. You can fib and tell everyone all day long that if the end of the world was near, you'd have caviar, chateaubriand and foie gras. You know where I'll be? In the drive thru at Taco Bell. After I had my deep-fried, bacon-wrapped hot dog stuffed with cheese & jalepenos, of course. Below is a recipe that combines a bunch of my dirty little food secrets in one bite. I mean, what could possibly be better than a snack made of mac & cheese, bacon, jalapeños and Doritos – THAT YOU CAN EAT WITH YOUR HANDS? Have one. Your secret is safe with me. Heavily butter the mini-muffin tin and sprinkle the tablespoon of panko over the muffin cups lightly. This will not coat the cups completely. Not even close. Melt 2 Tablespoons of butter in a medium sauce pan over medium high heat. Whisk in flour and salt. Cook for two minutes, stirring constantly. Add the milk in a steady stream while whisking the butter/flour mixture. Bring to a NEAR boil, lower the temperature and continue whisking until the mixture becomes thick, approximately three minutes. Add the cheese & stir until the cheese has melted. In a large bowl, combine macaroni, yolks, bacon & jalapeño. Add the cheese mixture & stir well to combine. Spoon about a Tablespoon of the mixture into the prepared muffin tin cups, pressing slightly to compact it into the tin. Liberally sprinkle crushed Doritos over the top of the bites. Cook for 15 minutes. Cool the bites 10 minutes and serve. Disclaimer: The author of this recipe is not liable for any harm that may arise as a result of eating this dish. Like a heart attack. Or morbid embarrassment. *If you don’t prefer spicy, be sure to seed & devein the jalapeño. *The smaller you chop the jalapeños, the hotter the dish will be. More surface area = more spice. For gosh sakes, please don’t skimp on the butter when greasing the tin. You want to be able to remove them easily. You can make these up to one day ahead. Cook as directed & refrigerate. Reheat at 350 degrees on a cookie sheet for 5 minutes. I'd be best friends with a hilarious woman who can secretly cook me ridiculously decadent crap any day.